Place all the ingredients except the watermelon slices and sugared jalapenos in a shaker filled with ice and shake. Strain into a coupe or martini style glass. 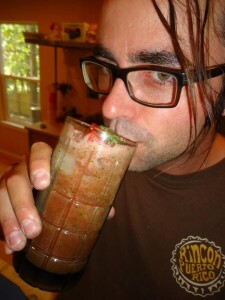 Garnish with a watermelon slice float with a few sugared jalapenos on top of the watermelon float. *Jalapeño Infused Tequila-place 3 sliced (round) jalapenos in a large mason jar filled with tequila repasado and let infuse for 4 days. *Sweet Cilantro Syrup-Place 1 cup water and 1 cup white sugar in a sauce pan and bring to a boil. Let simmer for five minutes and take off heat and cool. While cooling add the zest and juice of one lime. *Sugared Jalapenos- Take the jalapenos that were soaking in the tequila an place in a jar with 1 cup of turbinado sugar. Shake gently until totally covered. Let macerate in the sugar for about 2 hours, genetly shaking the jar every 30 minutes or so.